In yesterday’s podcast, Chad and I talked about some communication issues in marriage. So, I thought today it would be fun to create a checklist of ten things that we can all do TODAY to communicate love to our husband or wife. You want your marriage to change for the better? This list is a great place to start working on it. 1. Give your spouse at least one genuine compliment. If you feel like there’s not a single positive thing to say today, look harder. Find something. Even if it’s just that you like the fact that he wears deodorant. Hey, it’s a start. 2. Find one act of service to do for your spouse. It can be something big (finally clean out that disastrous garage) or something small (pour her a cup of coffee), but find one way to serve your spouse. 3. Say only positive things about your spouse. Today, don’t let a single negative opinion about your spouse cross your lips. In fact, find something good you can say about him to someone today. Bonus points if that someone is your mother. 4. Ask your spouse at least one question that shows that you care. Ask him how his day went. Ask her if she’s excited about a new movie coming out. Show that you value your spouse’s feelings and opinions. 6. Choose to ignore little annoyances. I know you hate it when you can hear your husband chewing. I know it drives you crazy when your wife’s makeup and hair tools are spread all over the bathroom. Today, let it go. 7. Ask your spouse this question: “How can I help you today?” It doesn’t matter if you have five million projects you need to complete by bedtime. Stopping to ask your spouse this question (and then following through if he needs help) will make him feel more loved than you know. It also communicates that you’re on the same team. 8. Give your spouse top priority. Today, put your spouse before the kids. Before the neighbors or your mother or your best friend. Give her that feeling that she used to have when you would zero in on her when she walked into a room. 9. Pray for your spouse. If you want your marriage to change, if you want your spouse to see things differently, if you want peace in your home, if you want to be a better husband or wife, pray about it. Ask God to help you. Ask God to bless your marriage. 10. Say, “I love you.” Words matter. Don’t assume that your spouse should know that you love her. Say it. Today and every day. What are some of the best communication tips that you have ever received? What works in your marriage? This week’s podcast is all about marriage, in honor of our seventeenth wedding anniversary coming up this weekend! Somehow we still ended up talking about Muppets and my tripping problem. Thanks for listening! On Monday I had to have a wisdom tooth extracted. I have never had a procedure like that done at the dentist before, and I was nervous about it. I sat nervously in the waiting room until the hygienist called my name, and I followed her all the way to the back of the building, past all of the rooms where lucky people were just getting check ups and xrays, back to the rooms where the bad stuff goes down. I felt like I was being led to the electric chair. I could see the sympathetic looks that employees and patients were giving as I trudged past, headed toward what was sure to be my doom. I settled into the chair, and the pink-scrub-wearing hygienist mercifully gave me the laughing gas, so I lay and listened to the echo-y sounds of activity happening in the next room. A teenaged boy was in the next chair over. He was also getting a healthy dose of laughing gas, and he kept saying, in a cracked and giddy voice, “My arms feel funny.” Some employees were trying to keep him from texting girls in his current state. Finally the dentist came into my room and did his work. It was unpleasant, but painless. I can’t help but feel like I did some of my best thinking while I was in the chair, high on laughing gas. I probably had some of my greatest ideas ever, but somehow all I can remember is the teenager repeating, “My arms feel funny,” while a dental hygienist laughed at him. I think that I felt encouraged by the fact that the guys cared enough to ask Google about it. But, what I’ve been hearing from readers of my blog are two main things. The guys are saying they resent being forced to romance their wives. The girls are saying their husbands are clueless about their thoughts and feelings. And, with romance, like all things, the best solution to our problems can actually be found in the Bible. To the Christian men, I would say what I emailed to one husband today: Have patience with your wife, and just remember that God calls husbands to love their wives as Christ loves the church. Jesus holds no good gifts back from us, so you are doing best when you err on the side of spoiling your wife rather than letting pride hold you back from showering her with love in whatever form that she needs it. 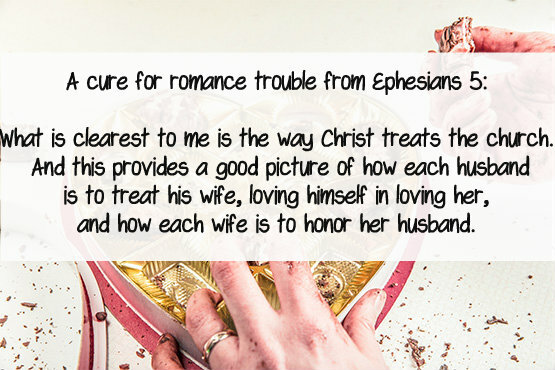 To the Christian women, I would say: Have patience with your husband. He cannot understand what you haven’t communicated to him. Don’t tell him one thing when you want another. God calls wives to submit ourselves to our husbands, which DOES NOT mean that we are subservient or that we have to just accept it when we are mistreated or misunderstood. But, it does mean that we are to be open and honest, not manipulative or cold, so that or husbands understand the best way to love us. Above all, we married people should communicate. We must talk about our expectations and then genuinely try to love each other in the ways that specifically speak to our spouse. The more we communicate, the better we understand each other and the more equipped we are to express the real love that is in our hearts. One last word to any man or woman who felt disappointed by the outcome of their Valentine’s Day. We all want to feel loved and adored by our husband or wife. But, they are not the source of true joy, and we can’t expect them to bear the weight of making us feel our worth. Only God can fill that role. Turn to Him and allow His comfort and love to soothe your heart. Pray for your marriage and for your spouse. Love them well even when it’s hard. And, love God more.